Trigger Point Pain Can be Neutralized with this Amazing Technique. Trigger points are like concentrated knots in the muscles, which often radiate pain into tissues remote from their location. At Hands for Health, Ginny Hofrichter can untie a trigger point in seconds, without relying on deep, painful pressure. 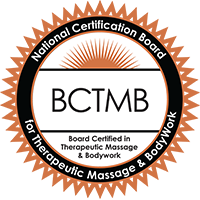 Pain Neutralization Technique, taught by Stephen Kaufman, D.C. (from Denver, Colorado), is a profoundly effective way to neutralize the pain of trigger points and sore muscles. It is a simple technique that involves stimulation of the involved muscle and movement of the tissues related to it in a way that “turns off” the neurological reflex. When the appropriate contact is made, the pain disappears, often immediately. If you want to erase your trigger points now, call Ginny for an appointment: 860-560-0368.